Hidas Chihuahuas is located in Southeastern Pennsylvania. 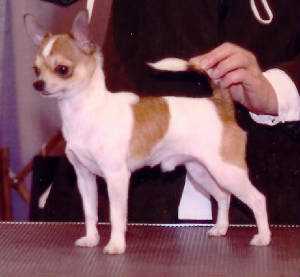 Our goal is to produce Chihuahua's that are good representations of the A.K.C. breed standard with excellent temperaments, while practicing a high standard of responsible breeding. All of our puppies are home raised in a clean, friendly environment and socialized with children from an early age. Our main goal is to produce quality puppies, not quantity. On occasion a show or pet puppy will become available and only to the very best of pre-approved homes. Under no circumstances will any of our puppies be sold to pet shops or puppy mills. On the following pages you will find our Title Holders...spend a little time a browse through our Contenders, and of course, always a favorite our Puppy Hopefuls, don't forget to take a peek into the Nursery and our favorite site is At Home, a tribute to our friends that have welcomed our dogs into their homes. Occasionally there are puppies and adult dogs Available, and we would like to hear from you so please feel free to Contact Us.